The importance of distinguishing bile duct hamartomas (von Meyenburg’s complexes) from metastatic liver disease. Multiple bile duct hamartomas are an occasional incidental finding at autopsy. However, with the increasing use of radiological methods to aid clinical diagnosis, the reported incidence is rising. This case report aims to serve as a reminder of this important mimic of multiple liver metastases and its radiological features. Recognising these features may prevent unnecessary invasive investigation in those who are otherwise well, and in patients with primary malignancy elsewhere, it will serve as a caution against the assumption of metastatic liver disease. A 65 year old man with a significant smoking history presented to the chest clinic with a persistent area of shadowing on his chest radiographs and hepatomegaly. There was no history of cough, haemoptysis, weight loss or change in bowel habit. Clinical examination was unremarkable apart from a firm non-tender enlarged liver. A subsequent chest radiograph showed complete resolution of shadowing. Routine blood tests, including liver function, were completely normal. 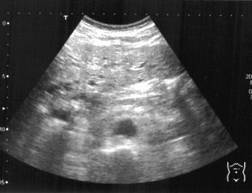 An abdominal ultrasound scan (figure 1) showed multiple echo poor lesions and a CT scan of the abdomen (figure 2) showed multiple low attenuating lesions suggesting metastatic liver disease. A liver biopsy (figure 3) under ultrasound guidance showed cystically dilated bile ducts lined with flat and cubical epithelial cells, surrounded by a fibrous stroma, consistent with a diagnosis of multiple bile duct hamartomas or von Meyenburg complexes. The patient remained well after six months. Liver function tests were again normal. Von Meyenburg complexes (VMCs) are believed to be ductal plate malformations of the smallest intrahepatic bile ducts due to disordered embryonic involution [1, 2]. Macroscopically, VMCs of the liver present as grey-white nodular lesions scattered throughout the liver parenchyma, usually measuring between one and ten millimeters in diameter .Microscopically, they are generally cystically dilated bile ducts lined by a single layer of cuboidal cells and embedded in a fibrocollagenous stroma . The prevalence of VMCs is estimated to be between 0.9% and 5.6% in autopsy series . 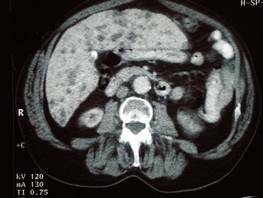 The major clinical significance of these lesions is in their frequent misdiagnosis as liver metastases on imaging . 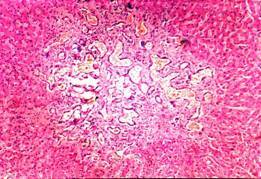 However, most patients are generally asymptomatic and have normal liver function tests. Although considered generally benign, VMCs have been reported to undergo malignant transformation . With advances in radiological techniques, there appears to be a rise in the diagnosis of VMCs. The liver ultrasound findings have being described as hyperechoic, hypoechoic or mixed heterogenic echoic structures as well as comet-tail echoes. The latter has been speculated by some authors as a unique feature of VMCs [3, 4, 6, and 7]. On CT images, multiple small hypo dense lesions, which are not normally enhancing after intravenous administration of contrast medium, have been reported [3, 6, and 7]. On MRI, bile duct hamartomas are seen as hypo-intense on T1-weighted sequences and hyper-intense on T2-weighted ones. MR cholangiography characteristically shows multiple irregularly delineated hyper-intense nodules, not communicating with the biliary tree following gadolinium administration [3, 6, and 7]. MR cholangiography may be superior to ultrasound and computed tomography as an imaging modality for VMCs by offering the ability to characterize the lesions, which are so typically seen in these malformations. In conclusion, multiple bile duct hamartomas should be considered in the differential diagnosis of multiple liver metastases on imaging especially if seen in-patient with otherwise good health and normal liver function tests. There is the danger of making an assumption of metastatic liver disease particularly if there is histologically confirmed extrahepatic malignancy. Therefore, recognising the radiological features of VMCs is desirable if we are to limit the number of patients referred for invasive investigations such as percutaneous or laparoscopic liver biopsy with its attendant risks. . As a final note, it must be said that these imaging modalities do not replace a histological examination in cases where the diagnosis is in doubt or malignant transformation is suspected. Interval imaging is recommended in oncology patients [3, 6]. All pages copyright ©Priory Lodge Education Ltd 1994-2007.